My visa got approved. I will probably go back to the USA to visit family and friends in late September and come back after the October holiday. I will wait until next year to go to Bali after their rainy season ends. I am not sure where I am going at the end of this year now. I'll have to think about that one. In the stands, almost touching the net, 66-year-old retired Beijing government worker, Liu Xincheng, stands up, leaving his son sitting, and dances to America's top 40. He ogles the pretty girls with his binoculars and falls in love with a medal sport that's more like a day at the beach. "I just get excited to support the players...it doesn't matter what country," he explains. This, he adds, is just as good as badminton or even karaoke. The other night I went to Hooters. It was a lot of fun! It is pretty much the same as Hooters in the US. There are some difference though... Besides the big Chinese flag and the ping pong reruns on the TV, the real big difference is the Hooter Girls. They spend more time going around to the tables and singing songs for the customers. Another difference is that you see more female customers here, which is good. On Saturday night I went out with about two dozen co-workers and friends to a place here called the Cotton Club. One of my colleagues is going back to IBM Norway, so we threw a going-away party for him. The Cotton Club is pretty new and is really nice. They have a pretty good DJ and a really good band. Everyone had a really good time. Some of the ladies even got me to dance. 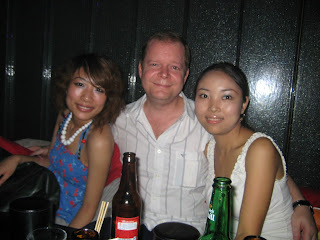 On Sunday I went to a singles party. Most of the people there were from IBM, but I think it was setup by the Software Park since there were people there from other companies too. Altogether there was about 90 to 100 people. We started at about 2:00 in the afternoon, and the bar was setup with about 10 large tables.in front of a stage. At each table there would be 5 or 6 girls, and about the same number of guys. Everyone was given cards that they could use to write down informatin about themselves, such as name, phone number, MSN id, age, company, etc... Everyone got about 10 to 15 minutes to talk to each other, exchange cards if they wanted to, and then there would be some form of entertainment for about 10 to 15 minutes. Sometimes the entertainment was provided by the staff of the bar, but most of the time it was provided by the guests. Some people sang songs, some people danced, someone even did some card tricks. The silliest one though was when they asked each table to make clothes for a girl and a guy out of newspaper and then model them. After the round of entertainment was over with the guys would all get up and go to the next table, where everything would repeated again. This went on until we had gone around to most of the tables. I was the only foreigner there, so I was kind of a novelty. Luckily there were quite a few girls who could speak some English and I spoke a little Chinese, which really surprised a lot of them. I ended up getting about a dozen cards from various ladies. Before the party started we were told that there would be a lot to eat, so most of us ate very little before the party. When we got there it turns out there was not much to eat. They provided some small snacks and pitchers of various drinks. The drinks were like coke, sprite, and orange drink with a little bit of alcohol. I guess they thought everyone would have a funner time if they were a little bit tipsy. A few of asked for water and just drank that. By the time the party ended at around 6:30pm we were all very hungry, so about 10 of us went out for hotpot. It was a rather enjoyable day. Assorted TV commentators keep opining that the Olympics are all about the brotherhood of man, rather than national ambition or patriotism. But don't tell that to the fanatically nationalist Chinese -- or to Kobe Bryant, the NBA star who is playing with Team USA in Beijing. In an interview Friday on NBC, the world's most famous basketball player told Chris Collinsworth how he got "goosebumps" when he received his Olympics uniform. "I actually just looked at it for a while. I just held it there and I laid it across my bed and I just stared at it for a few minutes; just because as a kid growing up this is the ultimate, ultimate in basketball." The Los Angeles Laker went on to call the U.S. "the greatest country in the world. It has given us so many great opportunities, and it's just a sense of pride that you have; that you say, 'You know what? Our country is the best.'" Beijing's ruthless demand for perfection was highlighted when Tan Zongliang was made to squirm on China Central Television after missing out in the men's 50m pistol competition. Even though it was his first ever Olympic medal, he was harried until he bowed his head and admitted he had "let his country down" for not getting gold. 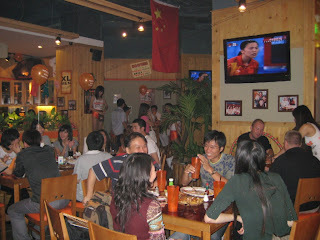 On Friday night I joined some friends at a pub here in ChengDu to watch the Olympic opening ceremony. There was a very large crowd there, and it was a lot of fun. Everyone was very impressed with the ceremony and the only complaints I heard was that it was very long. You can find pictures of the ceremony here if you have not seen them already. I think there were a lot of good parts to the ceremony, but I think the kids stole the show. With the multitude of people for most of the shows the few kids really stood out. The first was the little girl who sang a song, then later on their was a girl flying through the air holding her kite (same girl? ), then the kids who put the color and smiley face on the ancient painting, and finally there was the boy who walked along-side Yao Ming when the Chinese team came out (I did not know who it was until later... he is Lin Hao, who saved several of his classmates when their school collapsed during the earthquake on May 12th... story here). The funnest part of the ceremony for me was when they had the procession of nations. We had people from all over the world where we were, and people cheered for their country. 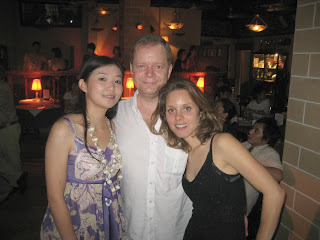 We had people from China, the US, England, Australia, New Zealand, Finland, Germany, Russia, etc... I am not sure who was the loudest among us... the Americans or the Chinese. One of the things that struck me about the different shows during the ceremony was that it demonstrated something significant about China... That is, Chinese always seems to do things en-masse. China has a huge population, so it should not be surprising that when Chinese look for a way to do something they tend to go with options that involve lots of people. For example, some non-Chinese that I talked to were surprised when thousands of people popped out of the falling and rising boxes during one of the shows. Everyone thought there were machines going up and down in patterns, but when I first saw it I could not imagine the Chinese building a huge machine to do that when they could have used thousands of people instead. I worked from home yesterday. The olympic torch was here in ChengDu, and the route it took through the city went by our office and they had closed that area off. In order to be able to go to the areas to view the procession of the torch you had to apply for permission, and I was told that if you are a foreigner or an ethnic minority not to even bother applying. Actually, with all of the olympic torch ceremonies in the past I only remember one... that was when Mohammad Ali lit the torch back in 1996. That was rather surprising since he had been diagnosed with Parkinson's syndrome years earlier. Pretty cool. The crowds of families who had woken their children before 5am for the historic event were pushed out and replaced by bused-in groups of Communist Party members, loyal workers and model students dressed in the uniforms of the torch relay's sponsors, Coca-Cola, Lenovo and Bank of China.